Totally realistic Appointment Book, since your previously define the hours of each doctor and the appointments duration. Multiple Appointment Book Views: 1 day, 2 days, Monday to Friday or the whole week, being able to mark if the patient attended or not. Phone Calls Scheduler is daily too, with the ability to mark if a call has been made or not. 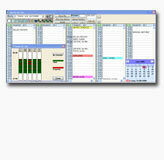 Appointment Book and Phone Calls Scheduler are independent for each doctor. Appointments reminders by email. With just one click, an email can be sent to one patient or to the whole appointment book on screen (a day, week, etc). Patient's attendances and absences report. Access to patient's medical history from the appointment book, with just one click. Ability to export the appointment book in CSV format, to be imported with Excel or some free web based calendars (Yahoo, Google, etc. ).